All the creatures have lives so that all creatures alive cannot escape from sickness and death. This is what illustrated by the poem— the moon dims or shines; it waxes or wanes. Even the towering trees will wither one day, let alone human’s life—from cradle to grave. Nobody can avoid it, despite that some people enjoy longer lifespan whereas others possess shorter one. As for human beings, they have to construct or sever relationships. Conjugal relation may comprise perfect matches, or strange bedmates; friendship may include sacrifice or separation, ranging from country to country, to person to person. 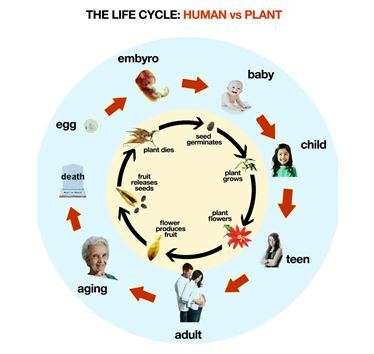 Since Professor Raymond Vernon from Harvard University in America first introduced the product life cycle theory in 1966, the life cycle theories in business domain have developed extensively. To illustrate, the customer life cycle management theory, the information life cycle management theory, situational leadership theory and industry life cycle theory, etc. have been proposed and improved successively. The supplier as an integral part of business for managing can be dated back to approximately the 1980s when the ISO9000-1987 version of QMS (quality management system) was first published. Although procurement had already taken place earlier, the management and control of the quality of procurement was more likely to rely on the inspection of received products. Since the standards of ISO9000 were established to highlight that suppliers should play the role of cooperative partners to manage relationship, the management of suppliers, including the business-related management as well as technology-related management, have come to the attention of people, and then developed. In fact, the relationship between suppliers and customers is the same as any other circular relationships. New business relations indicate new customers for suppliers on one hand and new suppliers for demanders on the other, resulting in not only game, but also cooperation for both sides involved. Therefore, a double-windmills pattern is formed with each part rotating with its own direction of the wind splendidly till the end of this relationship. Since someone introduced customer life cycle theory, it has emphasized that customers possess values and life cycle which refers to the whole process from suppliers establishing relations to completely terminating relations with customers. It dynamically describes the overall characteristics of customer relations in different stages. Generally, the customer life cycle can be divided into four phases insisting of prospecting, on-boarding, stabilization and off-boarding. Relationship should be mutual; otherwise, it can only be regarded as transmission rather than communication. Analogously, if someone know the state president, yet the state president doesn’t know him, it cannot be called as relations. However, if two people are familiar with each other, then the relationship can be built. Under mutual relations, customers, in effect, view the suppliers from a procurement perspective. To make it easier for comparison, the supplier-and-customer relations can be also divided roughly into four phases accordingly: Supplier Selection, Supplier On-boarding, Performance Management and Supplier Off-boarding. Under the same stage, the two will pay attention to each other, and stare at each other as well. 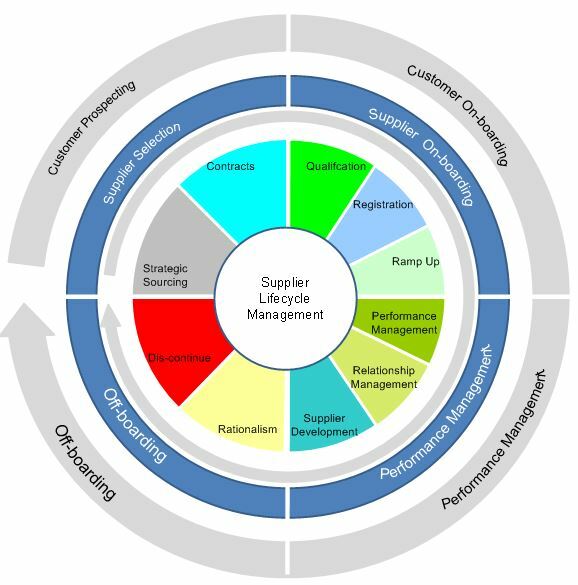 “ Supplier Lifecycle Management works from the premise that the supplier should be considered as central to procurement activities and processes, an approach which drives significant benefits… Seeing the Supplier as a Lifecycle can help Purchasing departments involve the suppliers earlier in the process so that their needs are satisfied in a deeper more effective manner. SLM considers all the elements of our relationship with a supplier, from initial engagement and information gathering, the sourcing process, through the work relationship, to development and on towards final parting of the ways” (Smith, 2012, p.19). Considering that the customer life cycle theory has been well-known while supplier life cycle management is relatively novel. Therefore, the writer will follow the sequence of customer life cycle to compare with and then introduce the supplier life cycle management. Customer Prospecting (Supplier Selection): This is the exploratory and experimental stage of the relationship, similar to the process that youth men and women seeking ideal partners. At this stage, the two parties will inspect and measure the compatibility, sincerity, performance of the other, while considering the potential liabilities, rights and obligations of both sides if they are to build long-term relations. The basic characteristics of this period is insufficient understanding and high uncertainty. Thus, the main goal of this period lies in evaluating potential value and decreasing uncertainty. During this period, customers will be likely to make some tentative orders, resulting in suppliers communicating and establishing relations with customers. As customers get to understand the business of suppliers, suppliers should reply to relevant questions accordingly. All customers in a specific segment are potential clients. The suppliers invest in investigations of all clients for the sake of determining exploitable target customers. At this moment the suppliers bare the input cost of customer relations, whereas the customers have not yet contributed significantly to suppliers. Nevertheless, from the perspective of clients, they practically confront problems of cost input and risk consideration compared with suppliers investigating clients, and balancing marketing inputs and future earnings, since it is impossible for clients to select considerable partners to purchase finite goods finally. Therefore, consumers need to take effort, time and money to seek, visit and contrast the most appropriate partners. Moreover, wrong selection will probably give rise to massive hidden danger. After all, eliminating suppliers at random is the worst way as the switching cost of suppliers appears to be too high. Thus, this phase of work is called “Strategic Sourcing”. In practice, people tend to subdivide them. The picture below illustrates typical strategic sourcing. In writer’s description, strategic sourcing is separated from the signing of diverse contracts, and taken as one part of Supplier Selection Process, despite that some definitions regarding strategic procurement flow have already included the signing of contracts. Customer On-Boarding (Supplier On-boarding): This is the fast-developing stage of the relationship, similar to the man and women evolving from establishing relationship to falling in love with each other, and to entering into marriage. If the supplier-customer relations can access to this stage, both the two sides are quite satisfied with each other during probation with certain mutual understanding and dependence. At this time, return gained from relations is increasing, while the scope and depth of mutual dependence is increasing as well. As they have realized step by step that the other party is capable of providing satisfactory values (or benefits) and implementing its duties in this relation, they are willing to commit to a long-term relation. During this period, with mutual understanding and trust of the two parties deepening, their relationship is becoming mature and their willingness to take the risk is increasing day by day, which result in increasing transactions. When the suppliers develop target clients successfully and the clients start to do business with suppliers, it enters into the customer growing period if the business is expanding constantly. At this moment, customers can be called as new customers, while suppliers can be called as new suppliers. Input over Marketing activities at suppliers is much less than it was in development period since their main focus transfers to development input in order to strengthen the relationship with customers and raise satisfaction degree, loyalty and confidence by improving product quality, stabilizing cost and perfecting services for the sake of increasing transaction volume. This moment the customers have already contributed to suppliers so that suppliers’ gains from transacting with customers become equal or even exceed the input, leading to profit pattern. Simultaneously, customers start to benefit from selling purchase products. In this stage, suppliers need to accomplish confirmation and formal registration of the whole business process, and enter several small-scale production or ramping up and stability validation through official orders by approving samples and passing the preliminary manufacturing process capability checking. Usually the key point of this process is the quality of product as well as the speed of quick entry into market. Here “On-boarding” not only simply refers to administrative registration, but also indicates repeated experiment and communication which aims to ensure smooth production. Both the two sides have already made a considerable amount of tangible or intangible input for sustaining the stable relations for a long time. Transactions remain stable or rise. As a result, in this period, the degree of mutual dependence of two sides reaches the maximum point of relationship development process. The relation is in a relatively stable state of game, despite that different suppliers present different relation characteristics of treating clients. For instance, the characteristics can be segmented by two axes—business value and attraction— into four quadrants: Develop, Marginal, Core and Exploit. Overall, the suppliers put less while customers contribute more. In initial phase, customers pay more than in other phases of life cycle, which brings about considerable profits for suppliers. In addition, suppliers will gain good indirect earnings due to increased customer loyalty. Meanwhile, transactions between suppliers and customers remains to be of high profits, and customers of this stage can be called as loyal customers. From the customer perspective, as the production becomes stable, the quality and quantity become balanced, and the service level increase with the two parties’ deepening understandings of the need and dilemma of each other, the key point of relations this time changes into promoting suppliers to improve the efficiency of Supplier Development continuously, reducing waste, maintaining or even increasing the market share and cutting down the profit level of existing suppliers to enhance the capabilities of resisting the market fluctuation. In practice, people treat activities in the stage as supplier relationship management, believing that the real relationship lies in this stage, since the purchase value at this time is considered as the biggest in the whole life cycle. At the meantime, as the emphasis of relation management, both sides will assess and manage the performance of the others. Suppliers will evaluate the satisfaction degree of customers regularly; suppliers will evaluate various performances of suppliers regularly in return with communication. Customer Off-boarding (Supplier Off-boarding): This is the stage of reverse in relations, similar to boredom on marriage. Most of the relations will not be terminated but will deteriorate, just like most marriages that will last till the end, only few will come to the end halfway. Divorce rate in developed countries is higher than that in developing countries. For example, divorce rate in several big countries from Europe and America is about 50% generally. Belgium ranks no.1 in divorce rate with 60% while India ranks the lowest with 1%. When it comes to China, in 2016, Beijing ranked no.1 in divorce rate with 39%. Also, the rate in first-class cities in higher than that in second and third class cities. Except the cultural factors, one of the reasons, as the writer estimates, rests on strengthened selectivity and reduced reliability, because the more developed an area is, the stronger the economic independence of individuals. In developed coastal cities at home, suppliers have more resources to choose from so that the time for maintaining relations will be shorter relatively. However, in terms of several small countries or areas like Japan, Taiwan, Korea and Hong Kong, the time for suppliers continuing relations with customers appears to be obviously longer for the reason that selectivity decreases in local area due to specific limitations. In actual supplier management, the new substituted suppliers always enter the market with another suppliers exiting gradually, just like the shape below. ( Supplier Y may appear at later stage). Recession in relations now always take place at the fourth stage after stabilization. In reality, relations can degenerate at any stage. There are many a reason giving rise to recessions, say, one party or both parties experienced dissatisfaction or changes in needs. Transaction amount falls back and profits reduce; one party or both start to consider ending relationship or even looking for alternative partners (suppliers or customers); the intention of initiating to discuss about ending relations, etc. When the transaction amount between customers and suppliers is decreasing gradually or rapidly yet the customers’ total purchase amount of the same product line does not decrease, the customers enters recession period, or intend to exit. 此时，供应商有两种选择，一种是加大对客户的投入，重新恢复与客户的关系，进行客户关系的二次开发；This time, suppliers have two choices: one is to increase the input to customers to recover and re-develop relations with customers. The other one is not to make too much input anymore and give up these customers step by step. Different methods will definitely generate different output effects. When customers do not have business relations with suppliers anymore, and moreover, the suppliers have already cleared the credit and debt relations, the customer life cycle is terminated completely. At this time, suppliers have little expense while no benefits, this is the ideal way of exit. Nevertheless, in practice, debt disputes always take place at this stage, just like unpleasant marriage with divorce. Here we do not describe in detail. It will help understand the conditions and positions of themselves so that suppliers can adopt management strategies accordingly to regulate and optimize the internal process of buyers and develop and manage suppliers reasonably. It also helps relevant personnel of internal purchasers to understand and join in formulation and execution of strategies in different phases of companies in order to unit front more quickly and reduce divergence in communication. Customers bare the expense in Supplier Selection and Supplier On-boarding. It not only suggests that administrative expense be used to collect, verify, save and manage suppliers’ material, but also indicates that effective selection, management and contract-signing will generate quick benefits and returns more often than not. 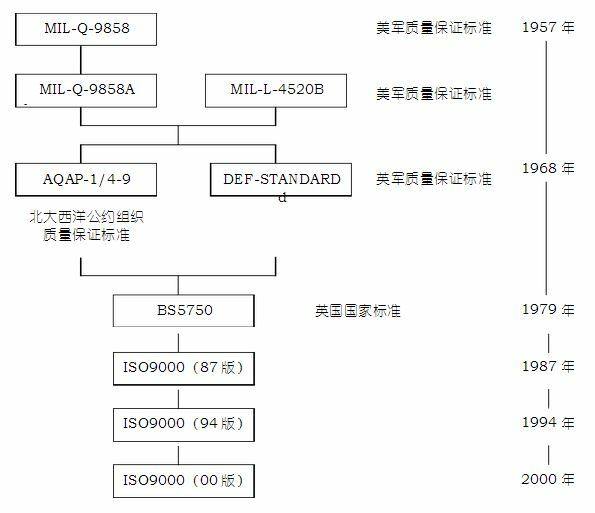 In addition, it is conductive to improving administrative personnel at earlier stage and efficiency of suppliers and customers. The unification and rapid implementation contributes to the rapid entry of purchasers and suppliers into supplier performance management, reasonably controlling and reducing risks afterwards via the earlier stage of life cycle. As supplier performance management results in relatively most profits from the early to middles stage of the whole life cycle, the extension of this period will produce considerable revenues for both organizations. From the aspect of procurement strategy, appropriate selection of suppliers, detailed analysis of procurement data, reasonable allocation of orders, exquisite supplier negotiations, improvement of quality, optimization of manufacturing and delivery process will create remarkable economic thrift and revenues. However, it depends on good operation of the whole “procurement machine” of purchasers and perfect coordination. The concept of supplier life cycle management, therefore, is conducive to directing strategies. Procurement risks seem to be everywhere but the supplier life cycle management enables people to take applicable actions to control the risks before they take place, such as distinct standard requirement to reduce the quality dispute, standard contract requirements to motivate suppliers to share and reduce the risks in delivery, guarantee, design and technology. It also helps examine the extension risk which happens in batch delivery in small-batch trial production at supplier on-boarding, prepare for entry of new suppliers in advance at recession to shorten the overlapping period, or even prepare a detailed exit plan before retreating from suppliers to minimize the personal lost as possible. 供应商全周期管理是一个真正意义上综合和整合供应商数据，信息以及管理的方法，并大力促使在整个从管理合规，到细致的采购数据分析，以及从关键战略供应商中获取更多利益等采购行动和活动中获得显著收益A truly holistic and integrated approach to supplier data, information and management is a huge enabler to achieving benefits across a whole range of procurement actions and activities, from managing compliance, to digging into deeper spend analytics, or getting more out of key strategic suppliers. GREAT ACKNOWLEDGMENT GIVEN TO MS. ZIZHU WANG (AKIKO) FROM GUANGDONG UNIVERSITY OF FOREIGN STUDIES FOR TRANSLATION.